For one thing, Apple monetizes products, not users. The tech industry really wants to unfriend Facebook. In the wake of the Cambridge Analytica data-mining scandal, tech industry insiders have been quick to criticize Facebook for inadequately protecting users’ private information. The latest to join their ranks is Apple CEO Tim Cook. Cook is not just critical of Zuckerberg’s enterprise — he asserts Apple would never make the same missteps. 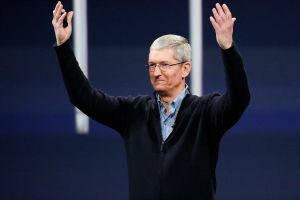 On March 28, Cook sat down with Recode’s Kara Swisher and MSNBC’s Chris Hayes to film a live interview for an upcoming MSNBC special: “Revolution: Apple Changing the World.” The program won’t air until April 6, but it’s already generating buzz, and blowback from Zuckerberg. That sounds somewhat dismissive, but Cook may have a point. During the interview, he touched on two fundamental differences between Apple and Facebook that could prevent the former from ever finding itself in the same situation as the latter. Firstly, Apple makes its money from products, not people. You’ve probably heard some version of the saying, “If you’re not paying for something, you’re the product,” and that’s essentially how Facebook earns a profit. You don’t pay for Facebook. Advertisers pay Facebook for you. Well, access to you and your information anyways. Apple sells smartphones, watches, computers, software programs, cloud storage, entertainment downloads, and more. With so many products, it doesn’t need to sell user data to turn a profit. So it doesn’t. “The truth is, we could make a ton of money if we monetized our customer — if our customer was our product. We’ve elected not to do that,” said Cook during the interview. Second, Apple has long prided itself on collecting far less data on its users than competitors tend to do, and protecting that data as much as possible. Apple uses end-to-end encryption on iMessage and FaceTime, ensuring as much as it can that those communications stay between the parties involved. When possible, Apple also stores users’ information directly on their devices rather than some centralized Apple server that could be more easily hacked. The company also attempts to protect the privacy of users from third-parties. As Cook noted during the interview, Apple carefully reviews every third-party app sold in its store to ensure it meets the company’s expectation of privacy. In 2016, Cook even refused a request from the FBI to create a software program that could bypass an iPhone’s security system as the agency worked to investigate a terrorist attack. On Friday, Zuckerberg defended himself against Cook’s criticisms during an interview with Vox’s Ezra Klein. According to Zuckerberg, a company can have an advertising-supported business model and still “care about” its users. As campaigns like #deletefacebook continue to circulate and Facebook continues to suffer from PR nightmares, the big question is whether those users (and the rest of the tech world) will still care about Facebook.